The creations you see at Ron Leach's booth at various art and craft shows, or at Arts at the Albion, are all carved in his studio at our cottage on the beautiful Kahshe River, south of Gravenhurst. The cottage property has been in the family for 5 generations, and is still in about the same condition as far as amenities go as it was 5 generations ago! - no hydro, no running water, propane lights, fridge and stove, wood stove for heat - very rustic - needless to say, it can be challenging, and getting the stones there is even more of a challenge! Every carving of Ron's has made quite a journey. 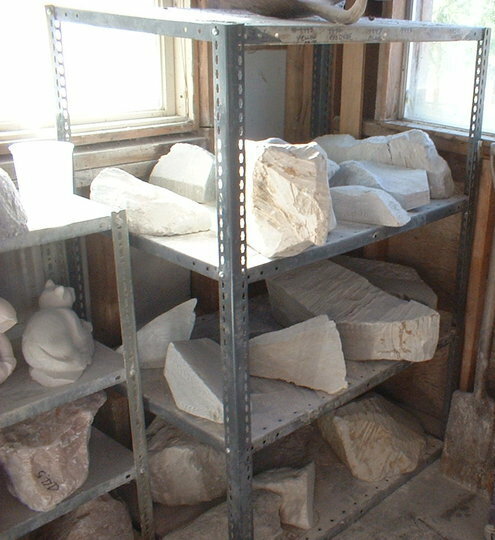 Much of the stone he uses is mined in Canada, but some comes from Brazil, and it is shipped to our supplier in Sebright , where we pick it up in our car (limited to 500 lb at a time) and bring it back up to the studio. 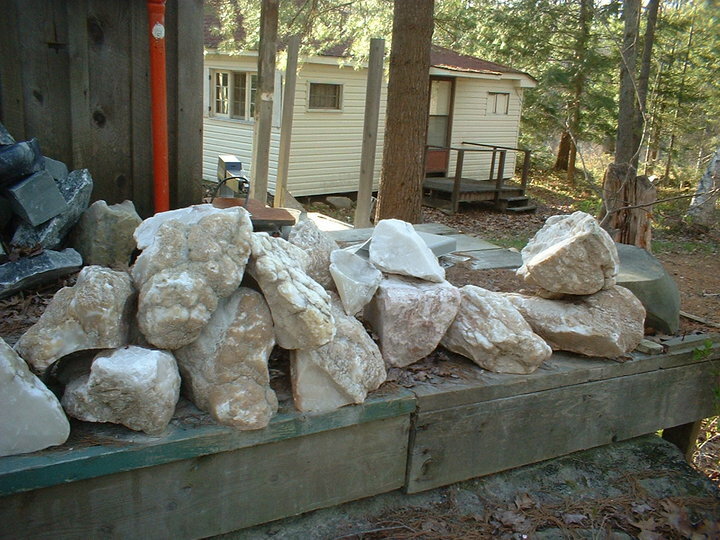 To get to the studio we have to turn off Highway 11 and drive 1/2 mile down a private dirt road to the Kahshe river, where we offload the stone onto the dock and then load it into a canoe. We proceed to paddle the short distance across the river to another dock where we unload the stone, place it in a wheelbarrow, and trundle it up to the studio. Once the stone is in the studio, Ron uses a bowsaw to cut out the basic shape of the carving he has in mind, then uses grinders to rough-shape it, and finally finishes the carving using riffler files, rasps, etc. At this point the carving is ready to be polished, which is done by hand using 4 different grades of wet/dry sandpaper. This part we both work on, often while sitting beside the river, watching the local wildlife (ducks, chipmunks, beaver, frogs, dragonflies) - which also serves as inspiration for future carvings. Finally the carvings go inside the cottage to be heated in the propane stove, waxed, buffed, and packed up ready for the trip back across the river to our storage unit in Gravenhurst, where they wait until it is time to be loaded back into the car for the trip to the show. On more than one occasion we have questioned the sanity of dealing with such a weighty material!